Cold weather is upon us and you know what that's like… You wrap up in layers of wool, cashmere, and knits. You venture outside to get smacked in the face by Jack Frost, tears streaming down your face, your nose redder than the poinsettias you left in your windowsill. When you get home after a blustery day, all you want to do is warm up by the fire, drink some soothing tea, and indulge in carb-loaded comfort food. Sounds like the perfect Canadian winter day to me. The experience of enduring the frigid temperatures and then coming home to your cozy abode was my inspiration for this shoot. I wanted to channel the warm colours, soothing scents, and familiar comforts of coming home at winter. I was inspired by the scents of chai, nutmeg, and cinnamon, the colours of red noses, dark winter nights, glimmers of fireplaces, and textures of exposed tree branches and fallen leaves. I absolutely love designing from nature. 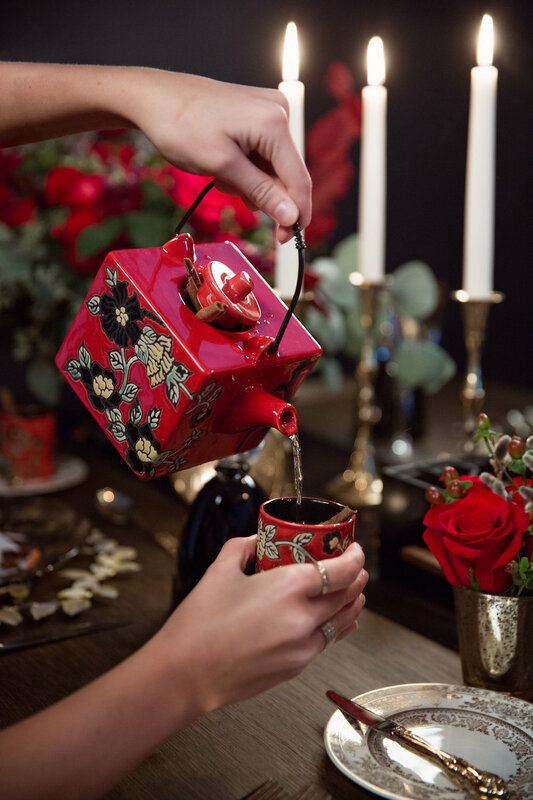 The feature of this table is the beautiful red teapots and matching tea cups. I wanted to create a full experience for guests coming into this winter fantasy. Imagine walking into a warmly lit room, greeted by the smell of decadent cinnamon and chai tea as you sit down. What a lovely way to set the tone for your evening and create an initial impact that goes beyond visual beauty. What's better is that guests can pour a little cup of the good stuff while waiting for their servers to drop off some focaccia bread and olive oil to the table. Not only seeing your environment but actually smelling and tasting deeply roots that experience in your memories. The best part is you can take the tea cup home with you as your party favour at the end of the night. An easy way to relive that cozy celebration at home. My design philosophy is if you have a solid design vision or "feel" go with your gut and choose items you love, odds are each piece will compliment each other nicely. The beauty of tablescape design is that there are so many close knit moving elements, creating what I like to call, Living Design because the guest not only looks, but sees, smells, touches, and eats as part of that design experience. The wine, the food, the guests at the table, the florals, the tableware all contribute to the beauty of this immersive environment you create. In my experience people fear bold colours or prints, but when all of these elements come together to create a living design, almost anything goes. Mixing textures, colours, and smells is tricky, but a little mix and match goes a long way to keep the guest interested, as they notice details the longer they look and engage. I designed this table for a winter wedding reception in a rustic restaurant or moody venue. 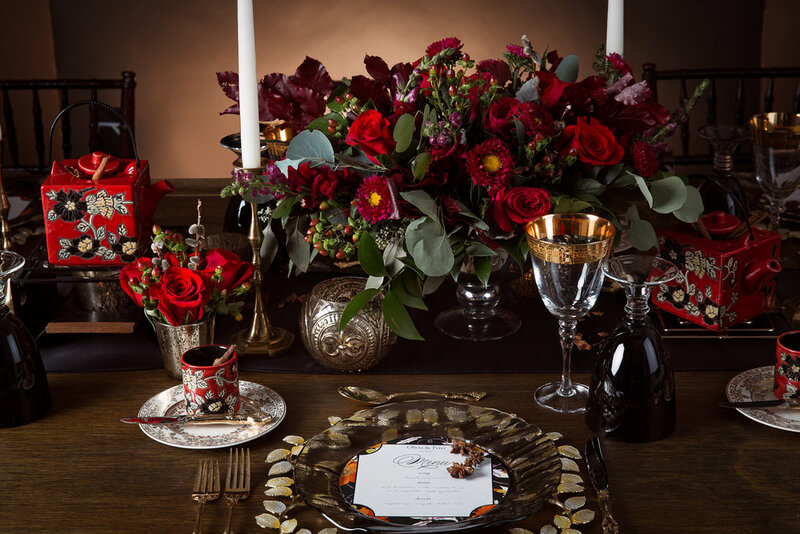 But a few slight changes to this table could leave you with a regal Game of Thrones inspired tablescape, a romantic valentine's dinner, or a bold evening soiree with your closest friends. It's all in the details. Vendors: Nick Merzetti captured the mood perfectly. Detailz Chair Couture provided the beautiful Harvest table and mahogany Chiavari chairs. Tableauscapes provided the cutlery, stunning charger plates and side plates, bold black water goblets, and elegant regal gold wine glasses. Around the Table provided the napkins and table runner. 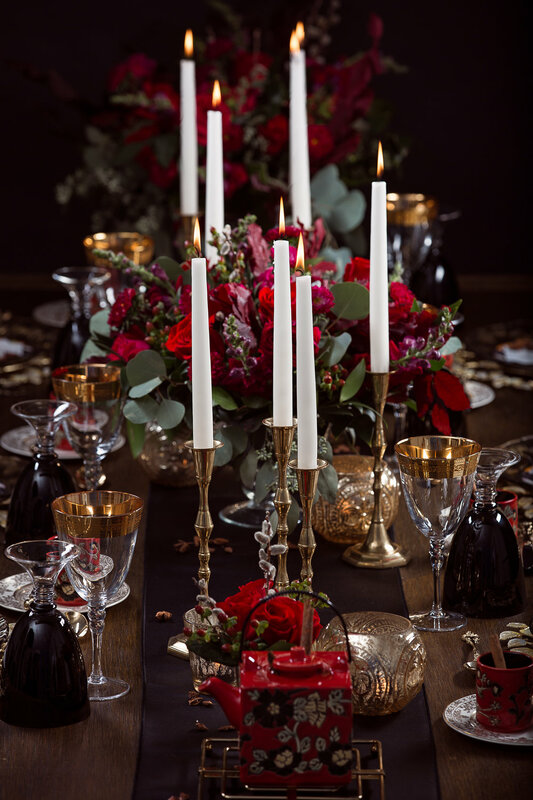 And our stunning, romantic florals, candle sticks, and glowing votives provided by Ardenian Flowers. Menu and table design by Madison Winters Event Consulting.